An unpiloted Air Force X-37B spaceplane, a mini shuttle making the program's fourth flight, is poised for launch Wednesday on a mostly classified mission featuring an unusual hitchhiker: a small publicly-funded satellite built to test the feasibility of using sails and the pressure of sunlight for propulsion. The winged X-37B, the LightSail satellite and several other small hitchhiker payloads are scheduled for launch atop a United Launch Alliance Atlas 5 rocket at the Cape Canaveral Air Force Station between 10:45 a.m. and 2:45 p.m. EDT. Forecasters are predicting a 60 percent chance of acceptable weather. The Atlas 5 first stage, powered by a Russian-built RD-180 engine generating 860,000 pounds of thrust, was expected to fire for about four minutes and 24 seconds to climb out of the dense lower atmosphere. At that point, the rocket's Centaur RL10C-1 second stage engine will take over, boosting the craft into an initial orbit. But in keeping with past practice, details about the spaceplane's planned orbit, including its altitude and inclination, or tilt with respect to the equator, were classified as were the primary goals of the mission, the planned duration and where it might eventually land. The first three flights ended at Vandenberg Air Force Base northwest of Los Angeles, but two shuttle processing hangars at the Kennedy Space Center in Florida have been taken over for the X-37B program and the fourth mission could end on the 3-mile-long shuttle runway. In any case, the X-37B, also known as an Orbital Test Vehicle, or OTV, presumably will be released from the Atlas 5's Centaur second stage shortly after reaching its intended orbit. And if past practice is any guide, the public won't hear anything else about the mission until landing. Whenever that might be. "It is what it says it is, it's a technology demonstrator," said Joan Johnson-Freese, a space policy analyst at the Naval War College. "I think they designed it to see what they could get out of it. And one of the things they're testing is how long can we leave it up? One of the things they seem to be testing is maneuverability. So I think it basically is what it says it is. "But what's interesting to me is it's being done in such an opaque manner. If the Chinese were doing this, oh my God, there would be congressional hearings on a daily basis and programs being ginned up to respond to it. It has capabilities that other countries aren't sure about, and so they're going to be very nervous about them. If it's a highly maneuverable space vehicle, that has some pretty significant implications." The Planetary Society's small LightSail satellite will be deployed from the Centaur about two hours after liftoff, presumably well after the X-37B's departure. The LightSail spacecraft, about the size and shape of a loaf of bread, is made up of three small CubeSats connected together. CubeSats are widely used for relatively modest space experiments because of their small size and low cost. LightSail is one of 10 CubeSat payloads on board the Atlas 5. Other sponsors include the U.S. Naval Academy, the Aerospace Corp., the Air Force Research Laboratory and California Polytechnic State University. On a Kickstarter page seeking funding, Bill Nye, the "Science Guy" and CEO of the Planetary Society, said light sails may one day open up the solar system to low-cost exploration by citizen-scientists. "Imagine it: unlimited free energy from the sun will provide CubeSats with propulsion and revolutionize access to space for low-cost citizen projects -- projects like ours or by teams of students and faculty at universities," he wrote. "This means that spacecraft, especially small ones like CubeSats, won't have to carry heavy fuels into orbit, and that the acceleration will be continuous. Even better, this is a journey that is directly funded by the world's citizens, like you, rather than by governments. LightSail is truly 'the people's spacecraft.'" This is the first of two publicly-funded Planetary Society missions to explore the possibility of using the pressure of sunlight to propel spacecraft. During this initial low-altitude flight the spacecraft will not do any actual sailing, but instead will test the CubeSat's solar power systems and sail deployment mechanism. The LightSail satellite is expected to operate about a month before plunging back into the atmosphere and burning up. "We won't fly high enough above Earth's atmosphere for solar sailing, but we'll test our sail deployment sequence and snap some pretty pictures," according to the Planetary Society's web page. If all goes well, the Planetary Society will launch a second mission next year aboard a SpaceX heavy-lift Falcon 9 rocket. Operating at a higher altitude, the spacecraft will attempt to sail, maneuvering using the pressure of sunlight alone. LightSail aside, the primary goal of Air Force Space Command flight No. 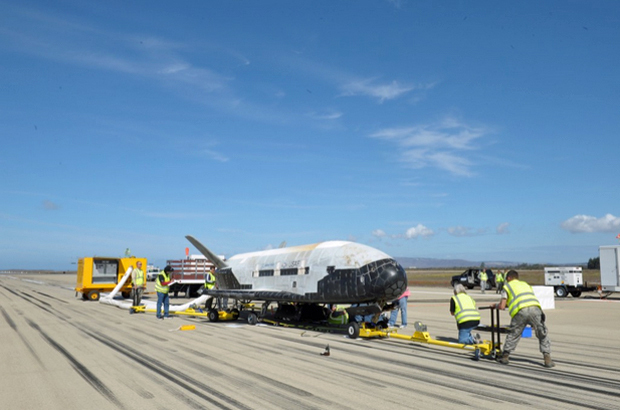 5, or AFSPC-5, is getting the military spaceplane into orbit. During three previous missions, the Air Force's two X-37Bs logged a combined 1,367 days in space, roughly a month more time aloft than NASA's entire space shuttle fleet during 135 missions over three decades. The first X-37B flight in 2010 lasted 224 days, the second, between March 2011 and June 2012, ran 469 days and the most recent mission, which ended last October, lasted 674 days. Built by Boeing and managed by the Pentagon's Rapid Capabilities Office, the X-37B looks a bit like a small space shuttle, complete with delta wings, heat shield tiles and a compact payload bay. But unlike NASA's space shuttle, which relied on fuel cells for power in orbit, the X-37B sports a solar array that extends from its payload bay, allowing extremely long flights. What the Air Force ultimately intends when it comes to using the X-37B in any kind of operational sense is not known. And from a potential adversary's perspective, that's a problem that demands a response, says Johnson-Freese. "If we're spending this much money, we must think we're going to get something really significant out of it," she said. "Like what? Well, that's the unanswered question. And if you're in the military, it's your job to come up with worst-case scenarios. "If I were another country, I'd be thinking what can this vehicle potentially do, either by approaching other vehicles or by taking things out of orbit, what can it do that's going to allow U.S. dominance? When I come up with those worst-case scenarios, I'm going to plan accordingly to counter them." Speculation equals threat, she said, and "the bigger the speculation, the bigger the perceived threat, and the more reactive you'll find other countries." While no details about the AFSPC-5 primary mission objectives have been released, two secondary payloads have been acknowledged. One is a NASA pallet carrying more than 100 samples of various materials that will be studied after return to Earth to learn more about the long-term effects of the space environment. The other is a Hall Effect Thruster, a small motor that uses an electric field to accelerate an ionized gas to produce thrust. The thruster that will be tested during the X-37B mission is a modified version of those flown aboard three Air Force's Advanced Extremely High Frequency (AEHF) communications satellites. "We are excited about our fourth X-37B mission," Randy Walden, the director of the Air Force Rapid Capabilities Office, said in a statement. "With the demonstrated success of the first three missions, we're able to shift our focus from initial checkouts of the vehicle to testing of experimental payloads."